Based on many observations of its gravitational pull in action, scientists are certain that dark matter exists, and have measured how much of it there is in the universe to an accuracy of better than one percent. The leading theory is that dark matter is “cold,” meaning it doesn’t move around much, and it is “dark” insofar as it doesn’t produce or interact with light. According to calculations done in the 1990s and simulations performed in the last decade, dark matter forms “fine-grained streams” of particles that move at the same velocity and orbit galaxies such as ours. “A stream can be much larger than the solar system itself, and there are many different streams crisscrossing our galactic neighborhood,” Prézeau said. “When gravity interacts with the cold dark matter gas during galaxy formation, all particles within a stream continue traveling at the same velocity,” Prézeau said. His analysis finds that when a dark matter stream goes through a planet, the stream particles focus into an ultra-dense filament, or “hair,” of dark matter. In fact, there should be many such hairs sprouting from Earth. A stream of ordinary matter would not go through Earth and out the other side. But from the point of view of dark matter, Earth is no obstacle. According to Prézeau’s simulations, Earth’s gravity would focus and bend the stream of dark matter particles into a narrow, dense hair. Hairs emerging from planets have both “roots,” the densest concentration of dark matter particles in the hair, and “tips,” where the hair ends. 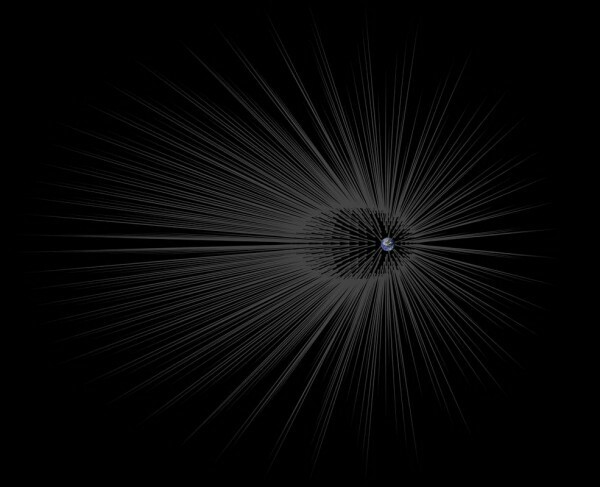 When particles of a dark matter stream pass through Earth’s core, they focus at the “root” of a hair, where the density of the particles is about a billion times more than average. The root of such a hair should be around 600,000 miles (1 million kilometers) away from the surface, or twice as far as the moon. The stream particles that graze Earth’s surface will form the tip of the hair, about twice as far from Earth as the hair’s root. “If we could pinpoint the location of the root of these hairs, we could potentially send a probe there and get a bonanza of data about dark matter,” Prézeau said. A stream passing through Jupiter’s core would produce even denser roots: almost 1 trillion times denser than the original stream, according to Prézeau’s simulations. “Dark matter has eluded all attempts at direct detection for over 30 years. The roots of dark matter hairs would be an attractive place to look, given how dense they are thought to be,” said Charles Lawrence, chief scientist for JPL’s astronomy, physics and technology directorate. Another fascinating finding from these computer simulations is that the changes in density found inside our planet – from the inner core, to the outer core, to the mantle to the crust – would be reflected in the hairs. The hairs would have “kinks” in them that correspond to the transitions between the different layers of Earth.